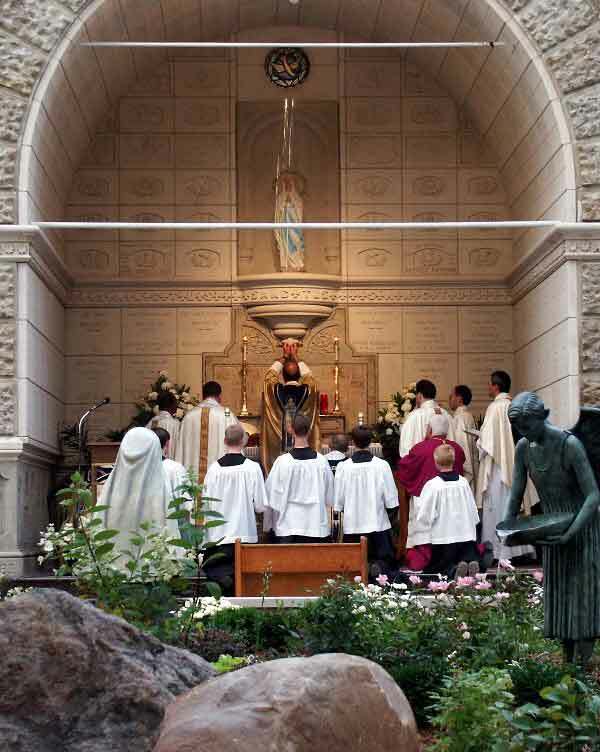 Greenville, S.C. – Diocese of Charleston Administrator, Msgr. Martin Laughlin, issued a statement late Friday afternoon from diocesan headquarters that rejected a Catholic priest's bulletin column issued Sunday, Nov. 9 that has since captured nationwide media attention. Immediate reaction from area Upstate South Carolina Catholics was one of sheer and utter disbelief. For those who have not followed this developing story, Father Jay Scott Newman issued his weekly letter in his bulletin Nov. 9 which was the culmination of a long, systematic catechesis on the duties of Catholics in the voting booth. His bulletin item told Catholics of his parish that if they had knowingly voted for Barack Hussein Obama, our now president-elect, they needed to refrain from receiving Holy Communion until they had partaken of the sacrament of Penance. Just two days later, the very same Msgr. Laughlin, most likely under enormous pressure from outside sources (U.S. bishops, other diocesan priests or perhaps the Government itself, possibly threatening the Church’s tax exempt status? ), publicly repudiated Father Newman’s statement as not being in full accord with Catholic doctrine. Having gotten wind of Fr. Newman’s directive, the Greenville News first carried the story as its front-page banner headline late last week. Talk radio quickly picked up on it and then local TV. The story has since spread nationwide. Father Newman had received 3,500 e-mails by Saturday from those in support and against his position. The Greenville News included comments from Stephen Gajdosik, who handles media relations for the Diocese of Charleston. His comments explicitly supported Father Newman’s bulletin item. Again, the message he directed to his congregation only through his parish bulletin, as he had done for the past 7 years, was fully in accord with what every marginally catechized Catholic should already know—to vote for a pro-abortion candidate when another pro-life candidate is available is grave matter; if it was done even after repeated catechesis from a pastor who is faithfully imparting the orthodox teachings of the Church, it means that person has likely committed a mortal sin. Mortal sins require the sacrament of Penance prior to receiving our Lord, body, blood, soul and divinity, in Holy Communion. To be precise, Father Newman never accused any of his parishioners of being in mortal sin, since full culpability cannot be judged by an outsider. However, he did use the terminology that their vote put them into “imperfect communion” in a certain manner or degree. My repeated telephone calls to the Diocese of Charleston’s Mgr. Laughlin went unreturned late Friday. Gajdosik referred all inquiries to Joseph Ohens, executive assistant to Msgr. Laughlin. By way of e-mail, Ohens referred me directly to the diocesan statement, while confirming “we appreciate your request for an interview with Msgr. Laughlin, however…” Ohens reaffirmed that the diocesan statement “is the position of the diocese and the Church.” Really? They “appreciated my request”? Then why didn’t the diocese, through its media relations representative, express this in the very same story where he affirmed Father Newman’s bulletin comments? If the diocese really wanted reporters to interview Msgr. Laughlin, which they obviously did not (it is a well-known tactic to issue a “media statement” addressing unavoidable bad news on late Friday afternoons when broadcast media is on deadline and when fewer reporters are around to cover the news over the weekend. In this particular case, it was most likely done intentionally to allow Msgr. Laughlin the opportunity to avoid having to answer any questions from media outlets), why did they tell all parish priests in a separate letter to refer media requests to the diocese, which was not going to return their calls? This is a classic example of the lack of fortitude and what many would simply call the “gutlessness” of the post-Conciliar U.S. Catholic Church. Instead of using the media to positively proclaim the Gospel of Life, as advocated consistently throughout the late Pope John Paul’s pontificate, Msgr. Laughlin of the Diocese of Charleston throws his priest under the bus. If nothing else, this woefully lacking statement from Msgr. Laughlin on the diocese’s and Church’s alleged “position,” displays the ultimate in injustice and scandal to Catholics who were edified by Father Newman’s courageous and patient teaching regarding the responsibility of Catholics in the voting booth. The statement itself is contradictory and does not adequately reflect Church teaching and will confuse Catholic faithful and non-Catholics of good will who were edified by Father Newman’s clear teaching. But intentional or not, such are the tactics of the modernists. So, in other words, the diocese has shut him down, referred all reporters to the diocese, which is not going to return calls or grant interviews, but instead refers everyone to their “statement” which selectively quotes parts of the Catechism of the Catholic Church about a Catholic’s conscience formation to “refute” Father Newman’s clear and orthodox Catholic teaching. The statement also uses faulty logic by concluding that if a Catholic has used all means available to form his conscience, it is then his own subjective decision to whom he should vote without any objective repercussions. I will let others who have had catechesis through the sixth grade using the Baltimore Catechism (because that is all that is necessary to dissect the modernist conclusions drawn by Msgr. Laughlin) analyze the erroneous conclusions drawn. Msgr. Laughlin and the rest of the priests of the Diocese of Charleston: Upstate Catholics and faithful Catholics everywhere who were edified and emboldened by Father Newman accurately presenting the Church’s views this week through local and national media are angry, disappointed and dismayed with your gutlessness. I have spoken to multiple Catholics who have made the decision they would no longer contribute financially to any collections that support the diocese. It is about time. A diocese that has been practically spiritually bankrupt for more than the 15 years my family has lived here should certainly be getting close to temporal bankruptcy. Certainly there is a connection here. Msgr. Laughlin and those other priests who supported and encouraged this public rebuke of a fellow priest of our Lord Jesus Christ: I am not certain whether or not you could possibly have understood the firestorm you set off by your lame and belated attempt to undermine Church teaching via the media throughout the entire United States. But know this: you have scattered the sheep. The Diocese of Charleston is without a Shepherd and the sheep have been scattered. Now, they are scattered and dispersed and emboldened. Not one single priest in the entire Diocese of Charleston to date has publicly supported Father Newman’s accurate reflection of Church teaching. Not one. But with this stinging public rebuke from your office, is it any wonder? I guess that some Catholics, despite repeated and continual evidence to the contrary, continue to hold out hope for such fortitude from at least one other priest. So much for “collegiality” within this post-conciliar debacle. The Shepherd is missing and the sheep are scattered. Charleston is a diocese with Cardinal Joseph Bernardin’s homosexual priest legacy that is now up to $12 million in payouts to priestly abuse victims, with at least two more lawsuits pending. This is a diocese that had to call an emergency meeting recently with the priests who head up deaneries in order to warn them not to spend any money due to poor investment performances that have the diocese teetering on the threshold of bankruptcy. As an exclusive, I have attached below a letter sent out by Msgr. Laughlin in October gravely warning priests against presenting anything from the pulpit that could be interpreted by the IRS as threatening the Church’s tax exempt status. I wonder if the Apostles, Church Fathers and martyrs for the Faith would have hidden the Gospel under a bushel basket in order to keep the Church’s tax exempt status in tact? This of course is the overriding issue and what is driving the cowardice of most bishops and priests. They are worried about losing their tax exemption. I wonder if the apostles and martyrs for the Faith were worried about the civil government removing their tax exemptions as punishment for forcefully preaching and defending the Faith. Msgr. Laughlin, the Sheep are scattered. You have set off a chain of reactions that has faithful Catholics around the U.S. infuriated at your inadequate presentation of Catholic teaching on this subject. Willingly or not, you have enabled the enemy now by allowing the media to portray to the entire world how radical and out of bounds Father Newman’s “personal statements” are, knowing that your statement carries no more authority in this context than a non-Catholic’s opinion. You have enabled the enemy. Barack Hussein Obama and his pro-abort, anti-Catholic minions must be pleased. FROM: Rev. Msgr. Martin T. Laughlin, P.A. As a sequel to my Memorandum of October 6, 2008, on the need to reserve the pulpit for the teachings of Christ’s Church only and not to use it as a platform for the endorsement of any political party or candidate, I wish to share with you some very important guidelines on political activity by Catholic organizations contained in a related correspondence I received from the office of our diocesan general counsel, A. Peter Shahid, Jr. The Diocese of Charleston, like other dioceses, is exempt from federal income tax under the United States Conference of Catholic Bishops Group Ruling, pursuant to Section 501(c) (3) of the Internal Revenue Code. As a result of this exemption, the Diocese of Charleston is ABSOLUTELY PROHIBITED from participating or intervening in political campaigns on behalf of or in opposition to any candidate for public office. It should be noted that though the tax exemption applies to organizations and not individuals, any partisan political statement or activity conducted at official church functions, such as Mass, parish or diocesan events or through parish or diocesan publications (bulletins and newspapers) will be considered a contravention of the law. Although the prohibition does not prevent the diocese or its officials from addressing public policy issues and pursuing legislative advocacy programs during the period of electioneering campaigns, the IRS maintains that such advocacies may constitute a violation of the law when such words as “conservative”, “liberal, “pro-life”, “pro-choice”, “anti-choice”, “republican”, or “democrat” are used in relation to a candidate, political party or an election, even if no candidate is specifically mentioned. In the light of these, I enjoin you, your parish staff and volunteers, to adhere strictly to the non-partisan policy of the diocese and the Church. Even in a discussion of a moral issue, do not directly or indirectly make any statement, in any medium, to support, or oppose a candidate or a political party for public office. However, I encourage you to strongly proclaim the moral issues for which the Church stands in non-partisan manner. I am aware that an issue arose four years ago when a pastor allowed partisan pro-life statements to be made during a church service, which caused the IRS to investigate our culpability. Our goal should be to remain non-aligned, beyond doubt. I urge you to join me in keeping our diocese free from avoidable violation of the law. If you have any questions, please call me at (843) 853-2130.